The script repeated for East Bengal yet again as they lost the I-League title in the final round, even after beating Gokulam Kerala by 2-1. Chennai City, needing three points to be champion, made no mistake this time. Even after conceding an early goal, they defeated Minerva Punjab by 3-1. East Bengal won the National Football League three times but have never won the I-League, a title that will forever remain elusive for them. They finished in the second position for the fourth time, most by any team. But this was their best chance, given the fact that they finished only a point behind champions Chennai City. This could probably end East Bengal’s disappointing journey in the I-League, as they are all set to participate in the Indian Super League from the next season onwards. In this article, we analyzed three seasons when East Bengal nearly won the title, only to falter at the last stage. 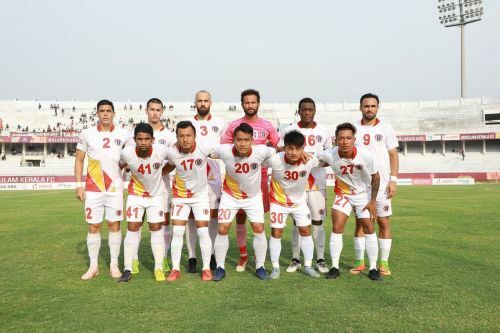 After three lacklustre seasons, East Bengal finally had finally started the fourth edition of the I-League on a brilliant note, routing Air India 6-1 in their first match. The Red and Golds have managed to build a decent team that season. They signed prolific goal-scorer Tolgay Ozbey from Australia along with talented midfielder Penn Orji from Nigeria. In the defence, there was certain Uga Okpara who with his tall and large figure, kept the opponent strikers away. However, after some poor performance under their Belgian manager Phillip De Rider, East Bengal lost their top position and slipped behind. 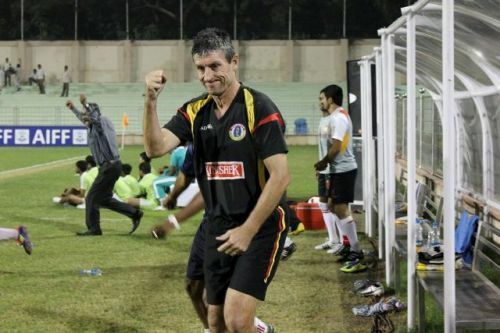 De Rider resigned and immediately East Bengal roped in former Bolton Wanderers player Trevor James Morgan. Morgan, a coach with a great tactical mind, revived the Red and Golds’ campaign and lifted them up. After 22 matches, East Bengal were sitting on the top, ahead of eventual champions Salgaocar by one point. East Bengal supporters had already started dreaming about their maiden I-League. However, East Bengal had to suffer successive losses against Goanese sides Salgaocar and Churchill Brothers, which blew up all their hopes. Salgaocar managed to win their last three games to win to conquer their third I-League title.